Hume is a fast growing region in Victoria with a social and cultural fabric and heritage to match its natural beauty. Renowned for world-class wines and gourmet food, the region is woven together by the Goulburn, Broken, Ovens, Kind and Kiewa Rivers – all vital to sustaining a rich environment, lifestyle and business. The Strathbogie Ranges represent the gateway to Victoria’s High Country and integral to the region popularity for nature based tourism and cycling. Hume’s strong economy is underpinned by a range of traditional and new industries, which help ensure jobs for a growing population – projected to increase by almost 40 per cent over the next 20 years. Hume comprises the Ovens Murray and Goulburn regions. School upgrade for Wallan Secondary College. Benalla, Beechworth, Bright, Corryong, Eildon, Euroa, Seymour, Shepparton, Mansfield, Wangaratta, Wodonga and Yarrawonga. Hume is extremely varied in its industry and employment make-up, with a strong concentration of agriculture in the west and the alpine, wine and gourmet food areas in the region's east making tourism a strong contributor to regional employment. Two of Australia’s nationally important transport routes – the Hume and Goulburn Valley transport corridors – traverse the region, providing an exceptional competitive advantage by linking supply chains to national and international markets through Melbourne, Sydney, Brisbane and Canberra. The Goulburn Valley area is a long established agricultural region, which is at the forefront of global food production. Traditional broad acre farming combined with dairy, viticulture, orchards, olives and aquaculture endorse the 'food bowl' label, and various large and international companies call the region home including SPC Ardmona, Uncle Toby's, Mars Petcare and the Woolworths Distribution Centre. Home to TAFE institutions, La Trobe University, the University of Melbourne and Charles Sturt University (co-located with GOTAFE in Wangaratta), Hume residents have higher education opportunities on their doorstep. There are many kindergartens, pre-schools, primary schools and secondary schools with both public and private options available. There are specialist education facilities across the region including some which are national centres of excellence for training in agriculture; equine management; industrial skills; motorsports; rural health and sustainable development. Recreation reserves hosting football, soccer, netball, hockey and tennis matches are prominent throughout the Hume region as well as golf courses. The high country is a haven for snow sports, and Lake Hume and Lake Buffalo popular for water sports. Wodonga is home to Australia's largest regional tennis complex and cyclists couldn't ask for more with the 100s of kilometres of sealed trails and roads passing through spectacular scenery. A number of festivals are held in the Hume region offering something for everyone. The Bright Autumn Festival, Euroa's Show n Shine, Wangaratta Festival of Jazz, Rutherglen Winery Walkabout, APS Head of the River in Nagambie, the Australian Superbike Championship in Winton and SheppARTon Festival are just a few to add to your calendar. Strong growth in demand for high quality food product in Asia, including fruit and dairy products, presents an opportunity for agriculture and food manufacturing, as well as supply chain industries such as freight and logistics across the region. Hume is home to natural attractions and other tourism assets across the Alpine region, Milawa food and wine region, amongst others that has the potential to benefit from growing international tourist visitations from Asia, particularly China. The Hume region has the opportunity to benefit from the expansion in freight activity, via the emergence of new transport and logistics businesses centred around key precincts such as LOGIC in Wodonga and the future potential of Goulburn Valley link. Hume has a particularly high exposure to the impacts of variable climatic conditions, with around 20 per cent of income in the Goulburn region coming from agricultural sectors. Large parts of the region are highly vulnerable to increased fire risk (including national parks and forestry plantations). Retention of skills and workforce will be important in securing key businesses in the Hume region into the future, particularly with an economy shifting toward services such health care and social assistance. The absence of a single dominant regional city and population centre means that reliance on private vehicles is high and accessible transport options are an ongoing challenge for Hume region residents. The RDV information portal has more detailed data and statistics on the Hume Region and regional Victoria more broadly. 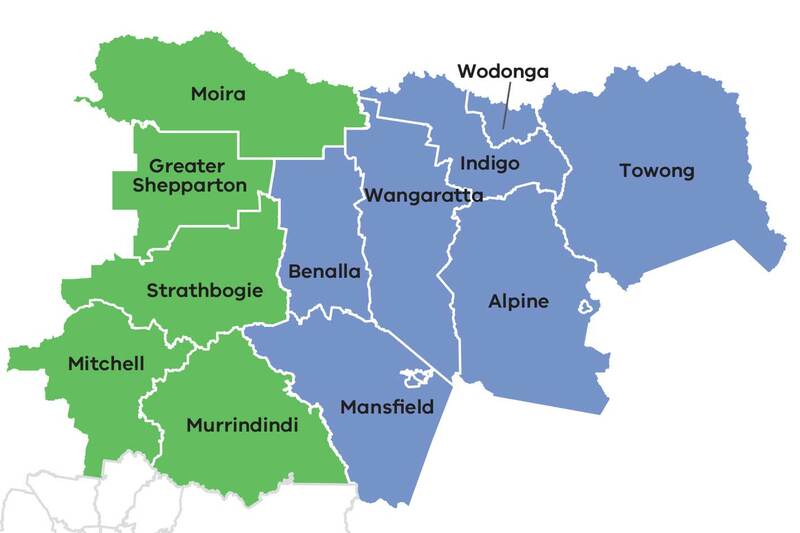 The Hume Regional Growth Plan is one of eight regional growth plans being prepared across Victoria. It provides a broad direction for regional land use and development as well as high level planning frameworks and the means to implement the strategic land use and infrastructure directions that are set out in the Regional Strategic Plans.